We’ve cleared out dead or dying trees and trimmed back overgrown trees, so that you can enjoy the beautiful views that surround your home. We’ve cleaned up the shrub beds, laid fresh mulch, and added lush green or colorful landscaping in the most visible areas of the community. 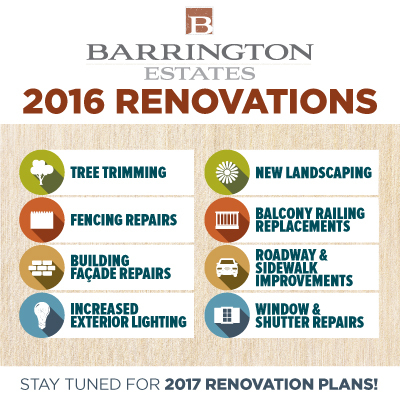 We’ve made repairs and improved the appearance of your patio fencing and the community perimeter fencing. For stability when you need it, we’ve replaced balcony railings where needed. From soffit repairs to new and improved gutters and downspouts, we’ve been busy improving the exterior condition of our buildings. We’ve also replaced siding, repaired trim, tuck-pointed the brick, and added fresh coats of paint. your driving pleasure. Plus, curbs and sidewalks will be enhanced in many areas to provide better accessibility for residents and guests. Whether you want to see, or be seen… we’ve added lighting throughout the community to improve visibility at night. Your windows are your eyes to the world, and we’ve improved your sight through window repairs and shutter repairs. As the 2016 work is drawing to a close, we are actively making plans for continued improvements in 2017. If you have feedback for changes you'd like to see, please share them with us at [email protected] Or comment on our Facebook page to tell us what you've appreciated so far about the recent improvements!